Nickname: Randy-Shinhye (Randy Johnson Shin Hye) - she got this nickname as she opened a baseball game. Her pose were so perfect like Randy Johnson (a famous MLB player). Favourite Baseball Team: Kia Tigers (a baseball team representing her hometown). 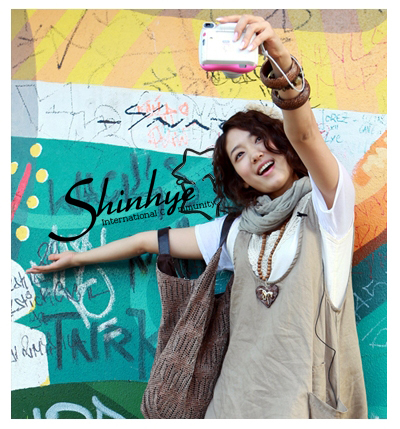 We will be bring you the latest news, information and updates about Park Shin Hye in English. In addition, we would also like to take this opportunity to thank the administration team for their wonderful efforts in bringing this website to you in a matter of weeks. Their dedication to this will be greatly appreciated by the international community. 이 사이트는 이다재다능한 한국여배우를 사랑하고 아끼는 국제팬들에의해 특별히 세워졌습니다. 이 커뮤니티를통해 우리는 당신을향한 우 리의 사랑과 존경하는마음을 서로함께 그리고 또한 박신혜 그녀와함께 나누고 싶습니다. 우리는 여러분들에게 박신혜님에관한 가장 최신의 소식과 정보 또한 업데이트를 영어로 전달해드릴것입니다.